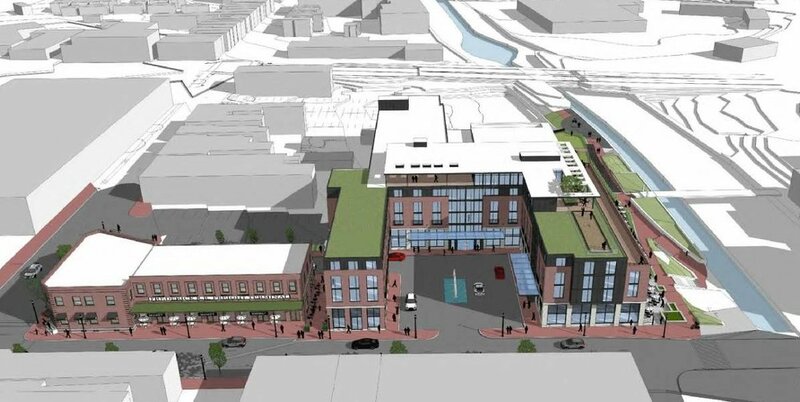 This morning, Plamondon Hospitality Partners, The City of Frederick and Randall Family LLC jointly took the next step required to build the Downtown Hotel and Conference Center at Carroll Creek and a related new public parking structure at 200 E. Patrick Street. The three parties involved filed the application with the City’s Historic Preservation Commission. This is the first step in the review and approval process. The Maryland Historical Trust will also review the plans. The proposed hotel incorporates historic architecture and industry. Plamondon Hospitality Partners plans to restore the historic Frederick trolley station building, which was used most recently as offices of The Frederick News-Post. Randall Family LLC owns the property, which is under contract to be sold as part of this project. The trolley building started out as the Frederick Railroad freight terminal, which included a trolley line to Thurmont and Braddock Heights. After that, the building was an office for an electrical company. In the 1950s, it was bought and converted to use for The Frederick News Post, with fully operational offices and printing on site. The application includes a request to remove the press room that was added to the trolley station building in the 1960s. The applicants are also requesting to demolish a building at the back of the property that replaced a structure that was one of many on the site of an operating tannery until the 1920s. A fire in 1909 destroyed all but a portion of this building, leaving part of the ground floor’s south wall. The building that replaced it later became a sales office for tanned products, and in the late 40s and early 50s, it became a poultry business, slaughter and packaging site. The existing building has been reconfigured since the 1950s and suffered another fire. Most recently, it was used for residential/storage until its current vacancy in 2009. The proposed hotel plan includes architectural elements and space dedicated to recognize Frederick’s association with the tanning industry. The Smart-Growth-inspired infill development project is designed to be harmonious with and complement the entire Historic District in scale, architecture and function. It will address traffic flow to and through the area by adding access points on East Patrick Street with a connection from South Carroll Street. The City is partnering on the project to build new public parking, approximately 170 spaces, which will occupy the foundation level of the hotel. The City’s part of the financial agreement is only for the public aspects of the development: parking and street improvements. Plamondon Hospitality Partners will build and own the hotel and meeting space.